» The cumulative installed capacity of offshore wind energy rose from 67 megawatts (MW) in 2000 to around 20 gigawatts (GW) in 2017. IRENA expects continued growth to 128 GW by 2030 and 521 GW by 2050. Cumulative investments in offshore wind are projected to reach USD 350 billion by 2030 and USD 1.47 trillion by 2050. » Along the way, ample opportunities arise for local value creation. Local income generation and job creation in the sector can be maximised by leveraging existing economic activities and building domestic supply chains. 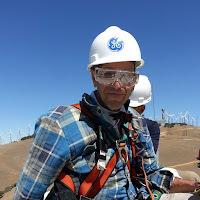 In particular, offshore wind energy can benefit from the many synergies in skills and occupational patterns that it shares with the offshore oil and gas sector. 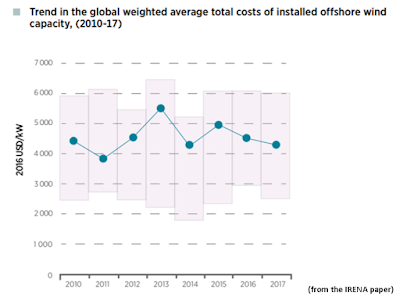 » The interaction of the offshore wind energy industry with other economic sectors generates additional revenue, both through supply chain activities and through induced demand for goods and services. 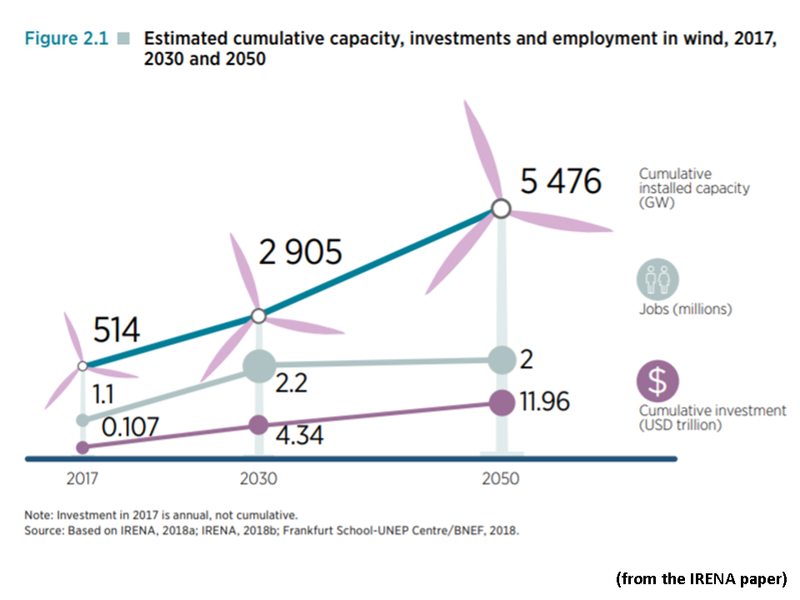 » IRENA estimates that the wind sector employed 1.1 million people in 2017. Most of these jobs are in the larger and more mature onshore segment. By 2050, the wind sector can potentially create up to 2 million jobs. 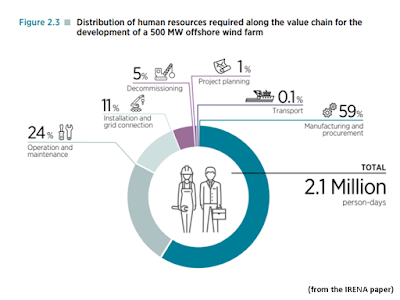 » In total, the development of a typical 500 MW offshore wind farm requires around 2.1 million person-days of work. » The labour requirements vary across the value chain, with a heavy concentration in manufacturing and procurement (59 percent of the total). The manufacturing of equipment offers the bulk of job opportunities in the sector. » Countries that do not have a sufficient capacity to manufacture equipment locally can derive jobs and other benefits in segments of the value chain that are easier to localise. For example, O&M accounts for 24 percent of total labour requirements; installation and grid connection represents another 11 percent of the total. » In order to avoid skills gaps, educational and training programmes need to be attuned to the emerging needs in the offshore wind industry. Training and skillbuilding form an important part of efforts to generate capable local supply chains. » Maximising local value creation depends on successfully leveraging existing expertise and capacities in other industries that can provide expertise, raw materials and intermediate products. In particular, steel, copper, lead and fiberglass are heavily used for the development of an offshore wind project. » To strengthen the industrial capability of domestic firms, policy measures and interventions are needed that contribute to increased competitiveness. Measures include industrial upgrading programmes, supplier development programmes, promotion of joint ventures, development of industrial clusters and investment promotion schemes. 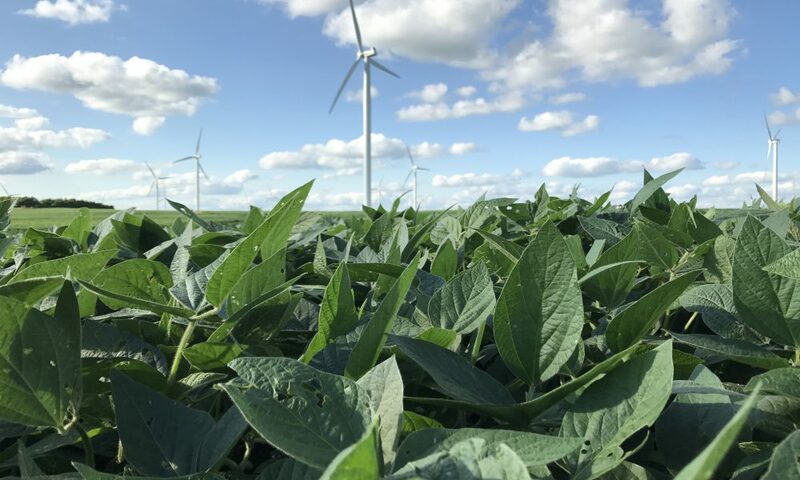 Renewable energy and energy efficiency technologies, with their increasing maturity and cost-competitiveness, can help bring economic and environmental objectives into closer alignment. The energy transition can only be considered within the framework of the broader socio-economic system and changes in the energy sector have impacts throughout the broader economy. Achieving the energy transition would have significant socioeconomic impacts. 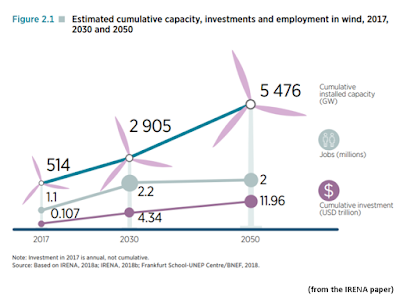 The latest analysis by the International Renewable Energy Agency (IRENA) shows that accelerating the deployment of renewable energy and energy efficiency as required to move towards a more sustainable development path (the REmap Case),1 generates a number of benefits in terms of gross domestic product (GDP), human welfare and employment relative to the Reference Case2 . At the global level, the energy transition generates a 1 percent increase in GDP by 2050, compared to the Reference Case. The socio-economic benefits go well beyond GDP improvements, including marked social and environmental benefits, or welfare, with a 15 percent increase. 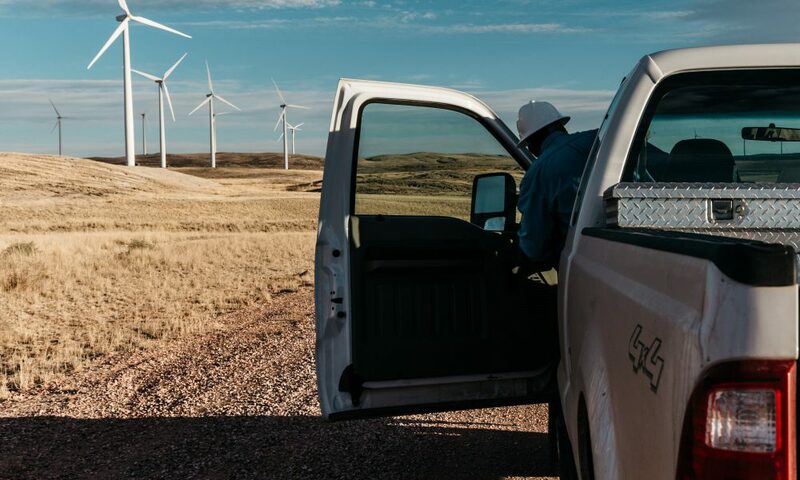 As for jobs, the transition could greatly boost overall employment in the energy sector and the shift to renewables would create more jobs than are lost in the fossil fuel industry. The same pathway would result in the loss of 7.4 million jobs in fossil fuels by 2050, but 19.0 million new jobs would be created in renewable energy, energy efficiency, and grid enhancement and energy flexibility, for a net gain of 11.6 million jobs (IRENA, 2018a). At the regional level, the outcome of the energy transition depends on regional ambition as well as regional socio-economic structures. Despite fluctuations in GDP and employment, welfare will improve significantly in all regions. However, as is the case with any economic transition, there will be regions and countries that fare better than others due to diverging structures, capacities and dynamics. Policy makers can help to make the transition process a just one by supporting the transition in the context of energy access, adopting social protection measures for people dependent on declining industries (including fossil fuels) and initiating economic diversification investments. In addition, supporting initiatives that help build and strengthen domestic supply chains capable of responding to new economic opportunities is crucial to achieve a successful global energy transition. 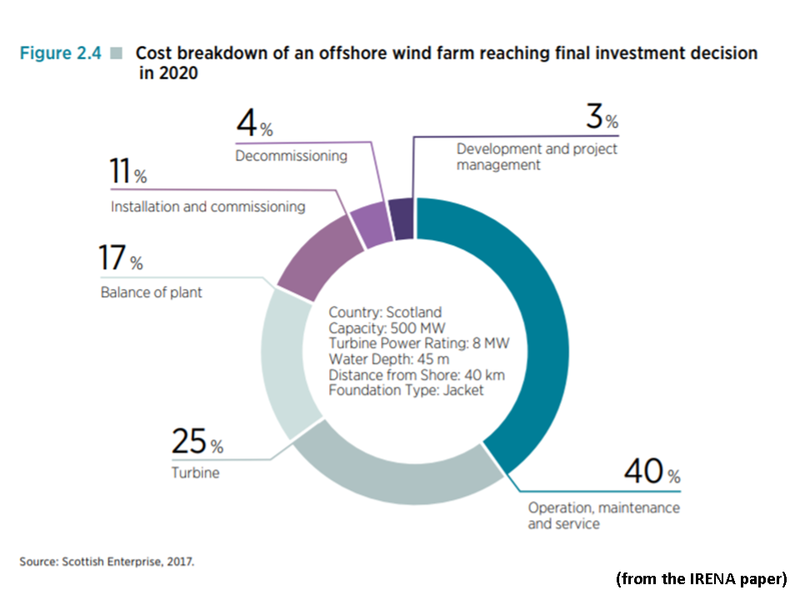 This study analyses the potential of the offshore wind industry to participate in the energy transition through the opportunities it offers for local value creation for countries that choose to develop the technology. The report starts with an overview of trends and drivers in the sector (Section 1). It then analyses the potential for value creation in terms of jobs and income along the segments of the value chain with a focus on synergies with the offshore oil and gas sector (Section 2). Section 3 goes into the activities in each segment of the value chain to analyse requirements for developing a sector focusing on human resources, skills and materials. The objective is to provide policy makers with an understanding of what is required to develop a local industry and the existing capabilities that can be leveraged or potentially developed to do so. Finally, a set of recommendations are presented to support informed decisions in policy-making to maximise value creation from the development of a domestic offshore wind industry while leveraging existing industries, and contribute to a just energy transition. 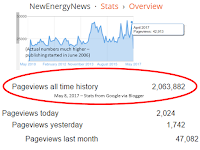 The scope of the study is global; therefore, the data presented in the report were obtained through surveys and interviews with internationally recognised experts and from desktop research that gathered information published by leading companies and specialised institutions in the offshore wind industry. 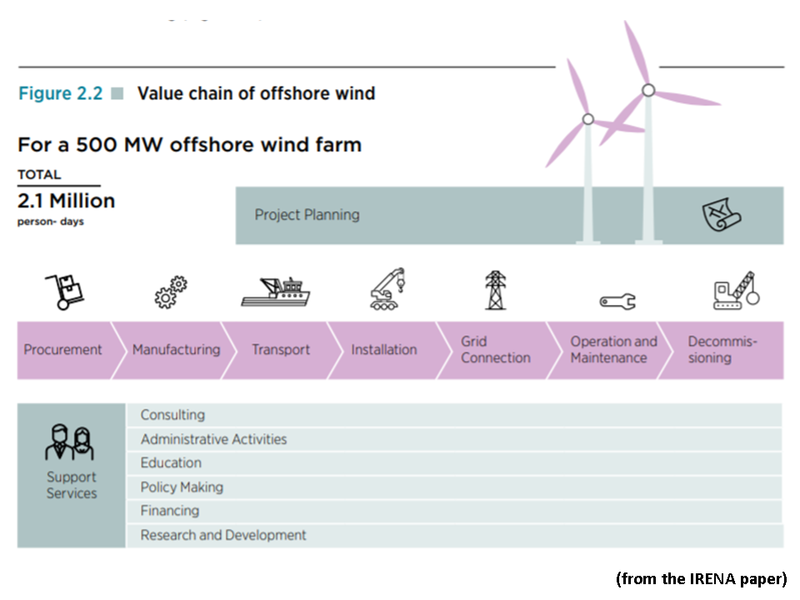 A significant number of leading stakeholders were interviewed and/ or responded to questionnaires on the requirements to develop an offshore wind industry. 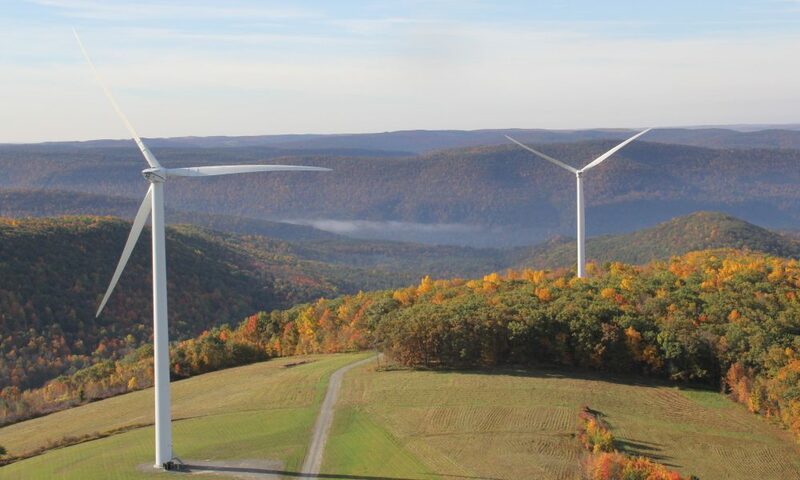 They included project developers, component manufacturers, service providers, energy authorities and national and global associations for wind and renewable energy. 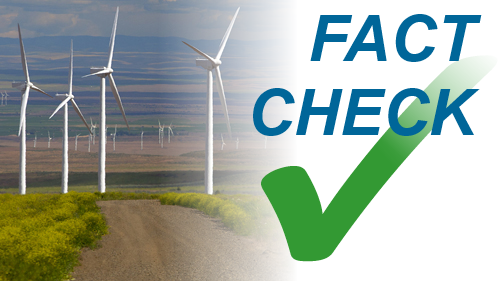 The study also draws on public reports of wind energy companies, including annual reports, technical specifications and equipment handbooks, and public price lists. The socio-economic benefits of renewable energy have become a key consideration in building the case for its wide deployment. Increasingly, governments understand that the expansion of renewable energy entails important co-benefits that go beyond the need to reconcile energy systems with environmental protection. 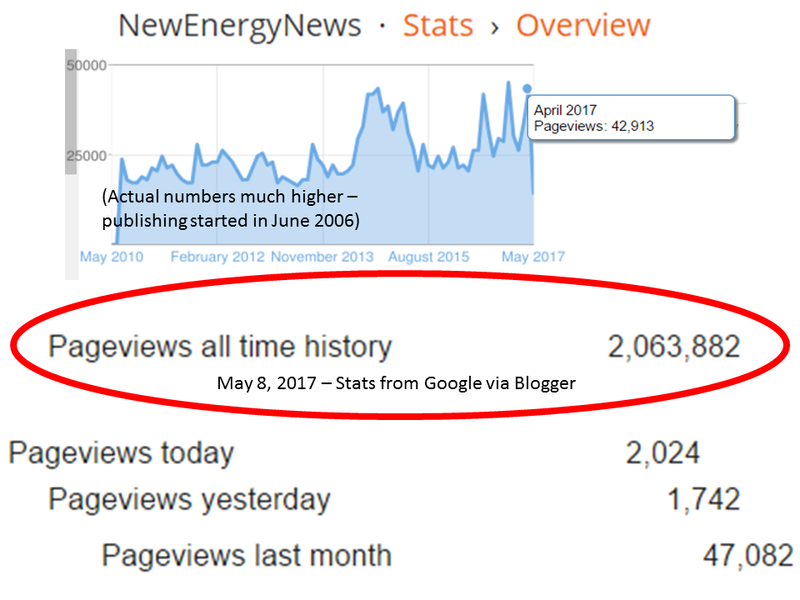 Economic analysis underlines the fact that the switch to renewables supports economic growth, creates employment opportunities and enhances human welfare. Opportunities for domestic value creation can be created by leveraging and enhancing capabilities in existing industries (like oil and gas) along the value chain or planning to develop them. To assess the case for domestic industry development in the offshore wind sector, policy makers need to analyse the labour, materials and equipment requirements of each segment of the value chain. Based on such an analysis, opportunities for leveraging local labour markets and existing industries can be identified to maximise domestic value. Regional and global market dynamics also strongly influence the decision to pursue domestic industry development. 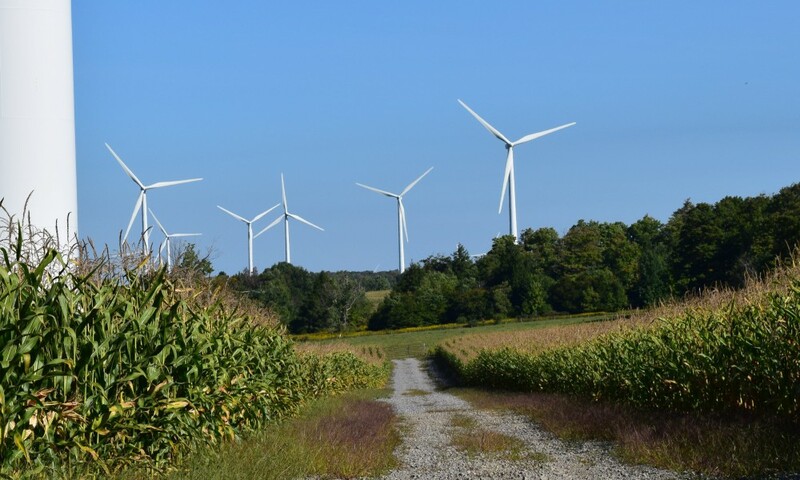 The degree to which the transition to offshore wind and other renewables delivers significant socioeconomic benefits depends on several factors. To navigate the transition successfully requires careful attention to a range of policies and a dedicated effort to ensure coherence among the different policy areas and the key actors and stakeholders in each of them. The main policy areas concern deployment measures in support of renewables, industrial policies to enhance capacities along the supply chain, education and training policies to ensure a well-trained and capable workforce, and a just transition policy to smooth the path forward and maximise the concomitant socio-economic benefits.